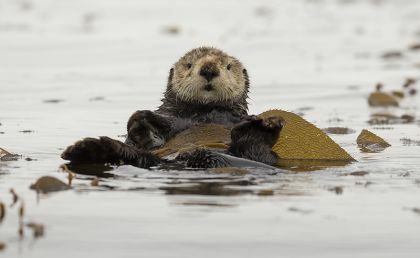 "For five days we were unplugged and felt like big kids at summer camp," reflect Jen and Eric in their delightfully descriptive Nature Junkies blog about "A Sea Otter Adventure". Having joined us from Maryland, coastal British Columbia was "magical". Thank you Jen and Erik - it was a treat to read your story! During the summer, our guests delight in little and big surprises around every corner. And during the winter, their trip photos and memories feed our collective souls: feeling a connection with people, places, and creatures. We hope that others enjoy reading about your experience, including that, "vacations tend to go by so fast but time seemed to stand still on Spring Island" - perfect. Here's that sea otter picture that you were hoping for...but which is nearly impossible to capture from the seat of a kayak (this one was taken with a BIG lens from a boat...)!